Okay folks, so whats the best deal you have got for a round trip from New York City to Delhi in the last 1-2 years. Lets start with $800. Perhaps some of you can say , yea. I am sure you can fly cheaper. Well i just got it for $550! 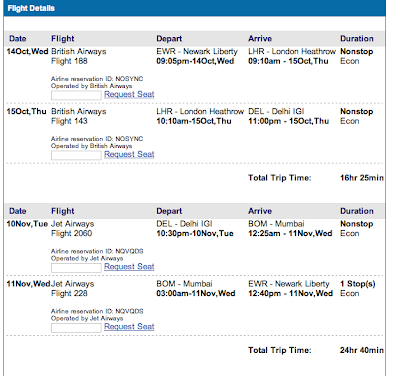 yes you read the right $550 roundtrip from NYC to Delhi. Thats $550 with all taxes and fees added. No other fees applies! And do note I am flying British Airways with one stop over in London and then returning via Jet Airways with one stop over in brussels. Now that is a rare deal! See the confirmed itinerary below. In fact the ticket price was just $275 with some $300 for taxes (i got a $30 promotion discount). And i got it just like that. Today. I had been looking for a deal for the past few days and was about to settle on a $950 round trip on Qatar airways (a 5 star rated airline. i was excited to try them out). But their site had some issues in the online booking payment page! I tried three times and then gave up. It was meant to be i guess because it really paid off to look at CheapOair.com. Till yesterday they had been showing flights as low as $775 but this was unbeatable.